Saif Carpets Pvt Ltd is equally passionate in discharging its social obligations as much it is keen to retain its position in the world market as a leading manufacturer and exporter of woolen and cotton carpets from India. The company is committed to contribute to various social causes and has been awarded the social accountability certificate issued by Registro Italio Navale (RINA), the international certifying authority in recognition of its efforts to discharge its social responsibilities as part of its business mission. The urge to contribute to the social cause took shape about five years ago when the company established a school for children in 2009-10. 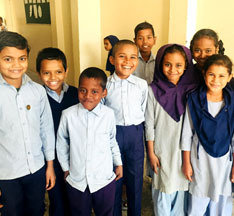 Tarbiyat in English means education and training and the school offers free education to the children of the needy people of the locality. The company has ambitious plans in contributing to other social causes too and the setting up of this school can be seen as the first major step in that direction. Presently there are 140 pupils in the school, 60 boys and 80 girls. The existing facility is available for children from the nursery up to class two level. The company has plans for gradual expansion up to the high school level in future. The tiny tots are taken care of by 6 lady teachers and 2 assistants. 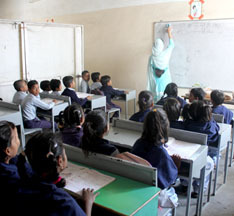 The school operates from 5 rooms of a single storey building and has so far successfully enabled 75 students to complete their schooling which is a very commendable achievement in this remote part of the country. English, Hindi and Urdu are the vernaculars that are included in the curriculum that also teaches general knowledge, science and Arabic art. 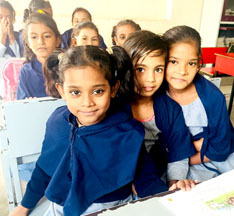 Not only is the teaching imparted free of cost, the students are also provided with free uniform and all other accessories for studies like notebooks, stationeries and school bags to encourage them in continuing the education. The company provides 100% funding and assistance in running the school and takes active interest to see that the objective of setting up the school is met. The amount of importance that the company attaches to its mission of social accountability is evident from the fact that a board of trustee of five members that oversees the function of the school is headed by the managing director of the company. This is an initiative taken exclusively by Saif Carpets Pvt Ltd that provides funds and manages the school on its own without any assistance from any outside agencies.